We are merely a day away from NXT Takeover: New York. Last night was the go home show for the event, and I’ve got everything wrapped up for you, as the biggest weekend in Wrestling is here. Can I just say I LOVE the War Raiders’ entrance, that horn and the Tron gives me chills! I really was trying to find out who they were fighting, but the crowd chanted “let’s go Jobbers” and the live crowd didn’t get an intro. This match was quick as predicted. Rowe and Hanson put on yet another demonstration of their move-set, as another quick matchup with the War Raiders plowing through these two young NXT trainees. We get a quick recap of Pete Dunne’s run as the UK Champion. It showed just how dominant Pete Dunne has been, leading right up to Walter’s introduction at NXT UK Takeover: Blackpool. I think we all knew on that day that these two were on a collision course, we just didn’t know when. Dunne’s impressive reign might end this Friday, but damn if it does that was one amazing run. I was excited to get the opportunity to cover this match and steal one from Brandon’s NXT UK! We get a clip of Candice backstage. She’s excited to watch the NXT Women’s Championship match at Takeover, as she is ready to jump into the Women’s Division and capture her goal of being an NXT Women’s Champion. She was approached by Aliyah and Vanessa Borne who thought she had no business competing for the title. Candice said she was going to show she was ready by taking out Aliyah. I’m excited for the NXT Universe to finally be able to see what Candice LaRae has to offer! Just seeing this matchup on paper, I knew it was going to be a hard hitting affair. Ryker is one rough monster, and Lorcan is just as hard of a hitter! Lorcan is the opponent that Ryker needed to help boost him as the power of the Forgotten Sons. Ultimately Ryker gained the victory, however Lorcan once again looked great. Now that the Tag-Team division has been bolstered up in NXT, I would like them to call up Lorcan to 205 Live, he has a LOT to offer that show, and could be a legit star. Next up was the hype video for Gargano vs Cole. It is going to be really interesting to see how this one goes. This video package makes me even more excited for this. If it was Gargano vs. Ciampa, it was easily Gargano’s Championship. However, I can see it go either way. It should be a good one for sure, but we’ll get there. Velveteen Dream and Matt Riddle’s turn for a video package. The Dream really excel’s at these type of interviews, I could watch them all day long! Again, another matchup that I am looking forward to for sure. We get a recap from FIVE weeks ago when Keith Lee and Dominik Dijakovic had their matchup on NXT which ended with a double-count-out. Keith Lee was in front of a bunch of press, and he was upset that they got bumped from their spot on NXT, when they were ‘replaced’ by the Fatal Five Way. He was there to announce that Lee and Dijakovic will collide in two-weeks on NXT. I mean we’ve waited this long, why not wait another two-weeks. Hopefully that feud hasn’t cooled off. This was a match between the two who kind of inserted themselves into the Women’s Title match, as it really should have just been Io vs. Shayna. Funny moment with Kairi whipping her tiny ponytail around much to the ire of Belair. It was a pretty decent match, except a few botches. Eventually, the Horsewomen came out to interrupt the match. For a moment it was the Horsewomen vs. the Sky Pirates and Bianca Belair. Referees and the entire Women’s locker room came out to break up the fight. 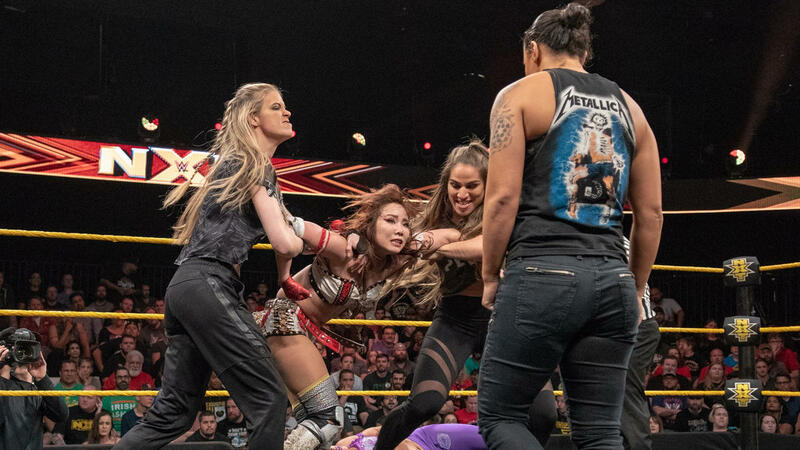 Eventually, Io Shirai was the last woman standing, as she stood in the middle of the ring with the NXT Women’s Championship as NXT went off the air. I have to give this one to Oney Lorcan. Yes, he went out the to be a glorified Jobber for Jaxson Ryker, however he did exactly that, while also standing out as a star. He has a lot to offer, and like I said before he could very easily fit into the 205 Live scene. He has the ability to be a big star, and while he isn’t necessarily the high flyer that people think of when they think Cruiserweights, his technical and hard hitting style is something they need for diversity. Oney Lorcan can be that man!